Galway's National Junior Cross Country Championship winners, Eanna Folan, Aaron Brennan Thomas McStay, Michael Healy and Joe Tannian. Galway's Laura Shaughnessy was on the podium at the hugely competitive National 10k road race championships in the Phoenix Park on Sunday. Shaughnessy of DSD was among a number of Galway athletes who fared well in tough running conditions. In addition to competing on the winning Irish team in their match with Great Britain which formed part of the event, Shaughnessy was also the third Irish athlete home in the nationals. She clocked 35.15 to claim bronze, behind only Shona Heaslip and Kerry O'Flaherty. Brendan McDonnell of GCH was first Galway man over the line, with a time of 32.48, a solid season opener. The GCH women's team won national team silver medals with a superb performance, and were led home by Regina Casey in 38.12, ahead of Sinead Brody who ran 38.42, and Tara Whyte with 41.05. Martin Kearney took O60 category silver with a solid and well paced 39.22 clockin . The GCH women's over 50 team won bronze medals, with Christine Kennedy, Barbara Bergin and Mags Sheridan running strongly, while the evergreen Kennedy won gold at over 60 and Bergin claimed silver at O55 level. 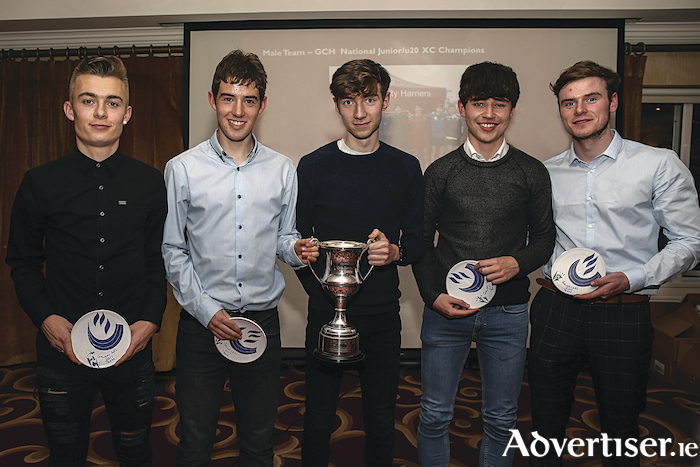 The 2017 Galway AAI Athletic Awards took place on Saturday in the Meadow Court Hotel, Loughrea. The guest of honour was Paul McNamara, the high performance director of Athletics Ireland. Category award winners, announced by the Galway Athletics Board, are U12 to U15 boys David Mannion; U12 to U15 girls, Emma Moore; U16 to U19 boys, Jerry Keary; U16 to U19 girls, Chloe Casey; U23 men, Cillian Greene; U23 women, Alanna Lally; Senior men, Sean Breathnach; Senior women, Laura Shaughnessy; Masters men, Martin Kearney; Masters women, Mary Barrett; Men's team, GCH National Junior/u20 Cross Country championship winners; Eanna Folan, James Frizell, Thomas McStay, Joe Tannian, Aaron Brennan, Michael Healy; Women's team, GCH National Senior women's marathon winners, Elaine Walsh, Siobhan Lee, Grainne Ni Uallachain. Hall of Fame, Martin McEvilly; Hall of Fame, Peggy Higgins; Outstanding contribution, Loughrea founders, Martin Smith, Colm Moorehead, TJ Beatty, John Coughlan, Martin Collins, Noel Loughnane. Connemara Marathon: The Connemara half, full and ultra-marathon series of races takes place for the 17th year next Sunday. The 39.3 mile ultra starts at Maam Cross at 9am, with the marathon off at 10.30 at Lough Inagh and the half marathon starting at Leenane at 12 noon . National Road Relays: The National Road Relays take place on Sunday in Dublin. GCH will field both senior and masters men’s teams. Alanna Lally will run for UCD in the senior women's event.